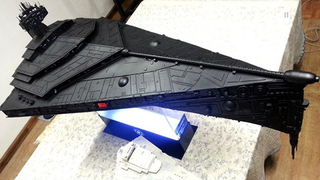 This mahoosive model of the Eclipse-Class Super Star Destroyer from Dark Horse's Star Wars: Dark Empire comics more than lives up to the excessive grandeur of the Imperial Navy. Just as it was ridiculously oversized in the comic, it's ridiculously (and awesomely) oversized here. This incredible ship was built from scratch by Fabio Delfino last year and is just packed with detail, with a list of features almost as long and impressive as the 8-month building time. The 1:15625 scale model (the dreadnought is mean to be 17 and a half kilometres long, because there's nothing like excessively huge spaceships in the Star Wars universe) is packed full of lighting - apparently 7 meters worth of LED strips are housed inside the ship's casing to light up the engines, docking bays and windows, as well as two sets of Red LEDs on each side of the ship and one in the nose with the superlaser array. There's even a bluetooth speaker jammed in there, because why not? You can see a lot more pictures at Delfino's Facebook page linked above, but for now, Insert Wedge Antilles here.